Month long Open Source event. As the new year dawned, we decided to do something different. The issue we faced was that only few people were interested in Open Source, and we had to lure them into our little cult. Hence, inspired from GSOC and GCI, we decided to organise an event named Opencode. The idea was slightly absurd - a month long event where we help participants develop Open Source software on GitHub . My team , consisting of Shubham Padia, Diwakar Vinay, Faheem Hassan Zunjani, Abhinav Khare, Pranjal Paliwal, Mubaris Hassan, Himanshu Shekhar and I, started working on 6 different projects as mentors. Since the event was a farely new idea we wanted to increase the hype so on new years we posted , comming soon posters. we even made a simple markdown based website for the event. 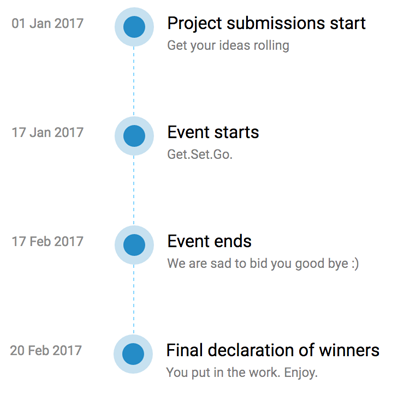 This is was our main project, to participate in the event a user had to send a pull request adding his name in this website (Made using jeykll). Thanks to github for making the amazing jeykll project. At the beginning the the website only had students and participants sections. Card flip to show details. Increased number of projects from two to six. Added projects section which uses github api to fetch number of stars and forks each repo has. Added participant blogs describing each persons experince during the event. Issues section which fetched all projects with label opencode and displayed them in the website. Loader for the website, Better background images, Watch trailer and facebook likes , share and changed facebook graph images. Chat box inside the website (gitter) , Countdown for the event and event scoreboard to view each persons commits. The event had a total of 66 participants out of which 63 where from IIIT- Allahabad. A tribute page , stats page and team page. All the contributions was from the participants i only managed the page with the help of Diwakar. To increase the Participants we also conducted workshops on Git | Github and Android game Dev during the event. In the beginning, the event attracted only few participants. But the number increased gradually, and as the event came to an end, we reached 66 participants with most of them from IIIT Allahabad. Together we created amazing things. As compared to normal GCI which has around 100-150 participants we need a lot more participants to call it a huge succes , but for the first time this was considered to be fair. As our number of mentors, publicity and prize money was limited. Participants had limited knowledge projects that required different skills were not much touched , which was a big draw back. Such as Android App, Django based projects etc. Bigger prize money and sponsors. Larger reach , we need to extend the event to other colleges as well. Our target next time is to reach out to colleges which are far off so that they will also get to know more about opensource. But overall it was one of the best one months i had in my B-Tech mentoring other students.Its all becasue of the Opencode team ,small but amazing for making it a success.